I was recently at the hackathon at True North PHP in Toronto. I spent the first part of it catching up with some people I hadn’t seen in a while and meeting some new people. I was then sidetracked by some email that had come in. When I finally was ready to start hacking on something, I had no idea what to do, so I decided to spend the time learning something new instead of making something. A Laravel user group just started up in my area and I had recently finished reading Dirk’s article on Laravel, so I decided I’d play around with that for a bit. I have to say, Composer really does make it a breeze to install, and Dirk’s article helped me get up and running quickly. Within about 5 minutes, I was able to start playing with the framework, trying out the various features. If you are looking for something new to try, this is a very low-cost-to-entry option. I didn’t have a project built to show everyone at the end of the hackathon, but I had a great time just sitting back and playing with a new technology – no deadline, no pressure, no stress. Play time is not only fun, but inspiring and educational. I think we should all resolve to spend more time playing. 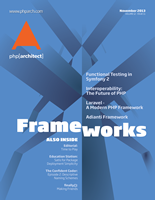 This being our framework issue, though, we wanted to give you a glimpse into several frameworks. Looking to do functional testing? Symfony2 can handle it, and Gabriel will show you how. Looking for a component-based, event-driven framework that’s easy to learn? Pablo will show you how Adianti can speed the development of your next business application. Have you ever thought that it would be so nice if everyone agreed on some basic standards so it was easier for developers to move between frameworks/projects? There are others out there thinking the same thing. Meet Larry and PHP-FIG, the PHP Framework Interoperability Group. See what they are working on and which standards they have in place and which ones they are currently working on. Once you’ve had your fill of frameworks, stop by the Month in Review and get caught up on the news. Then, be sure to check out our Confident Coder column. This month, Aaron discusses naming schemes and what they do for you and for anyone else reading your code. Do you love Github, but have some privacy requirements that make it difficult to use? Let Matthew show you how to privately host your internal Composer packages, just as if they were publicly available on Packagist! And last, but not least, be sure to stop by and hear what Eli has to say about making friends on our current community environment. Have a wonderful month, and if you haven’t already, be sure to check out our new print offering (http://www.phparch.com/magazine)! There is something very exciting about being able to walk away from the computer screen for a while and read a paper copy of php[architect].